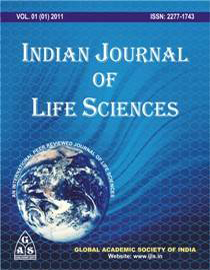 Indian Journal of Life Sciences (IJLS) is the official organ of Global Academic Society. Indian Journal of Life Sciences is a Peer Reviewed,Open Access,Online and International Journal of Life Sciences . The scope of journal is therefore necessarily broad to cover recent discoveries in structural and functional principles of life science research. It encourage and provide a forum for the publication of research work in different fields of basic and applied life sciences.